The Fairfield Inn & Suites Jacksonville Airport is within two miles of Jacksonville International Airport and perfect for travelers flying through Jacksonville. We offer a 24-hour complimentary shuttle service to and from the airport. Our hotel is centralized between many corporate industrial parks, a variety of restaurants, and JAXPORT. Whether you're traveling on business or enjoying our beautiful beaches, our hotel creates a place to relax and unwind. 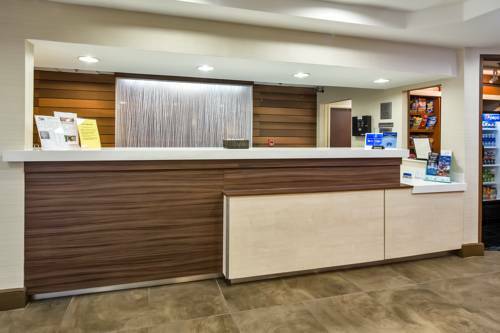 Our hotel is great for business travelers with smart amenities such as free Wi-Fi, a business center, and meeting room space rental. Each of our guest rooms offers free Wi-Fi, mini-fridge, microwave, and HDTVs with Internet TV where guests can access apps like Hulu and Netflix. The icing on the cake? Our friendly staff will make it feel like home. We look forward to hosting you!